If you have a maxed out your credit card, you may be scrambling to pay your outstanding bills. India’s technology hub, Bengaluru, with its dying lakes and mushrooming urban growth, is facing a similar situation – it has overexploited its groundwater and is now struggling to keep up with the demand, according to an expert. “We are using groundwater like an overdrawn credit card and we don’t have the capacity to repay,” said Samrat Basak of World Resources Institute India (WRI India) expanding on an analysis by the global research organisation. “In the absence of water prudent urban development, the future growth of Bengaluru will lead to significant stress on the already over-exploited ground water situation,” Basak said, quoting the data. The semi-arid city that is the capital of Karnataka, has been in the news for its water woes and projections that talk about the impending “Day Zero” crisis, a Cape Town like situation when taps could run dry. The WRI India analysis has supported the assertion calling for a paradigm shift from linear centralised model to circular decentralised model of water supply and strict implementation of aquifer recharge effort. “Considering any future climatic stress scenarios (deficient rainfall events), there is high probability that both surface water and groundwater sources of Bengaluru come under stressed situation during a same time or similar time period,” the analysis suggests. “The idea is to have an optimised mix of harnessing surface water from river and rejuvenated urban wetlands along with groundwater and treated wastewater of lakes,” Basak said. 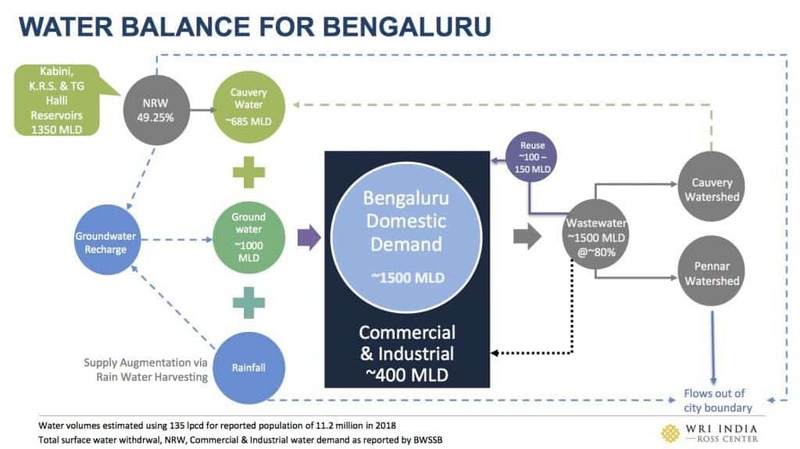 WRI analysis indicates that it is just a matter of time that parts of Bengaluru could be forced into a ‘Day Zero’ like situation if the current water supply-demand practices do not improve. Photo by WRI India. 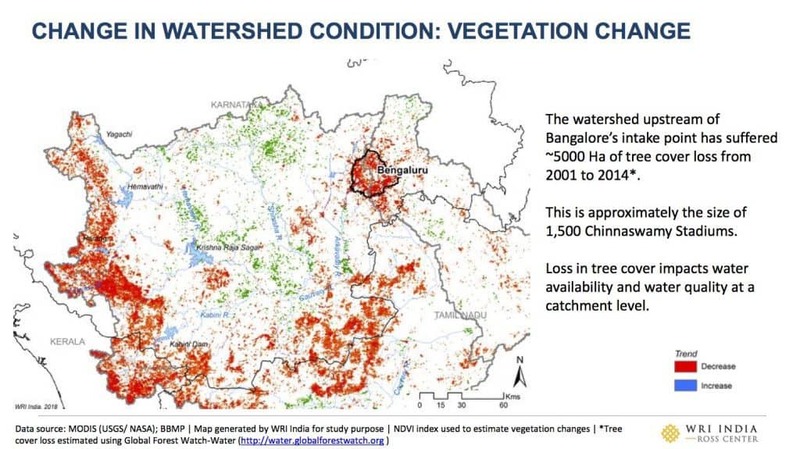 Loss in tree cover, multiple deficient rainfall events, doubling of population and built up area at the expense of open areas in the last 25 years, are some of factors that have pushed the city on edge of a water crisis, according to maps and data analysis provided by WRI India. 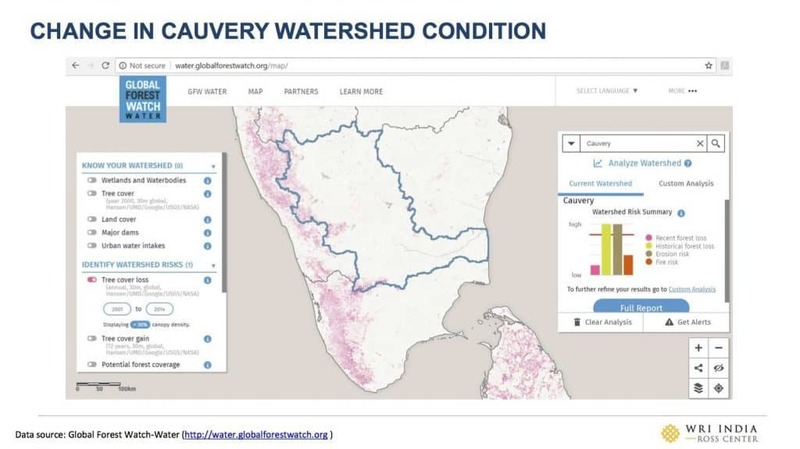 These maps/ data have been generated by WRI India as part of their ongoing research project on “City Water Assessment Tool”. “There should be a balance between how you use water in stress and non-stress period. During non-stress period, if we don’t use the surface water it just flows down to the oceans. During that period, instead we can keep groundwater as a hedge and use the surface water,” Basak explained. During summer when taps run dry, the demand for water tankers skyrockets. The total water demand (domestic plus non domestic) is slated to double from 1900 million litres per day (MLD) to around 3800 MLD between 2018 to 2031 as the population doubles, as per the analysis. “Under a business as usual scenario, the groundwater abstraction will increase from around 1,000 MLD (based on indirect calculations) today to around 1600 to 1800 MLD in 2031. As the city groundwater is already in over-exploited stage, it may not be hydrologically feasible and sustainable to meet any such increase in groundwater demand,” he said. 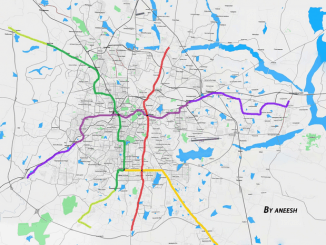 Even though the city primarily relies on the Cauvery river about a 100 kms away, experts who were not associated with the analysis, advocated nurturing resources within the city. 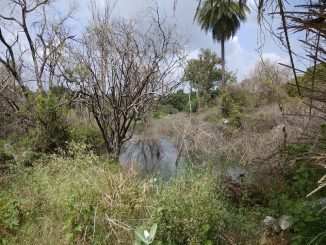 “It could potentially mean that we have a secondary dependable water source to bank upon – something Bengaluru does not currently possess,” researcher Hita Unnikrishnan who focuses on histories of urban water commons within Bengaluru, told Mongabay-India. Change in Cauvery watershed condition. Photo by WRI India. Urban planning, especially in the context of Bengaluru, should take into account the geophysical characteristics of the landscape, rather than relying on techno fixes that are both expensive, yet do not provide a promise of water security, Unnikrishnan of the University of Sheffield said. Rainwater harvesting locally through rejuvenated lakes would be the most appropriate decentralised option of meeting water demand, according to Indian Institute of Science researcher T.V. Ramachandra. “Another vital function would be groundwater recharge (which will accelerate with the removal of accumulated silt/sediment) and also non-contamination of groundwater. This idea will materialise, only if we have sensible and responsible citizens and decision makers,” T.V. Ramachandra said. The city founded in the 16th century was planned bearing in mind its natural topography, by tapping into natural depressions and an undulating terrain to create a series of networked water reservoirs that harnessed rainwater. At the same time preventing other issues such as flooding, informed Unnikrishnan. Lakes, while having provided water to meet the requirements of the city up until about 1895, also provided several other functions − both ecological as well as social. “Ecologically, they are microclimate regulators, urban biodiversity hotspots and enablers of groundwater recharge among others. They are also important for their aesthetic and recreational appeal within the humdrum of the city. They are important livelihood and subsistence providing resources to urban poor,” she said. Community involvement in restoration of water bodies like the Jakkur Lake provide some hope in the face of Bengaluru’s water crisis. Photo by Manu.mohan/Wikimedia Commons. As the city expanded, it witnessed a shift in dependence from local to distant sources of water catalysed by technological interventions and centralised piped system of water. “While in the precolonial past, it depended upon an interconnected system of rainwater harvesting via lakes and wells, today it relies on water that is pumped from a river (Cauvery) at a distance of over a hundred kilometres,” said a study co-authored by Unnikrishnan. 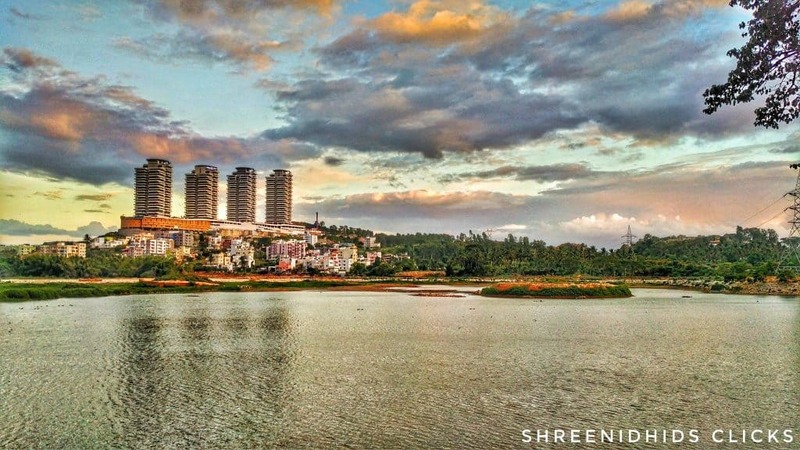 The major surface water intake point for Bengaluru is located at the Shivanasamudra section of Cauvery River located at a distance of 100 km from Bengaluru. Water is gradually pumped up to a height of 540 metres from this intake point to meet Bengaluru’s water demand, Basak pointed out. Bengaluru primarily relies on the Cauvery river, about a 100 kms away, for its water supply. Experts advocate nurturing resources within the city. Photo by WRI India. “The water flow at this intake point is controlled by two upstream reservoirs, the Krishna Raja Sagar (K.R.S.) and Kabini Dam. The water flow within K.R.S. is further controlled by a combination of three further upstream water reservoirs (Harangi, Hemavathi and Yagachi),” Basak said. The watershed upstream of Bengaluru’s intake point has suffered around 50 square kilometres of tree cover loss from 2001 to 2014, the size of 1,500 of the city’s popular Chinnaswamy cricket stadium. Loss in tree cover impacts water availability and water quality at a catchment level. 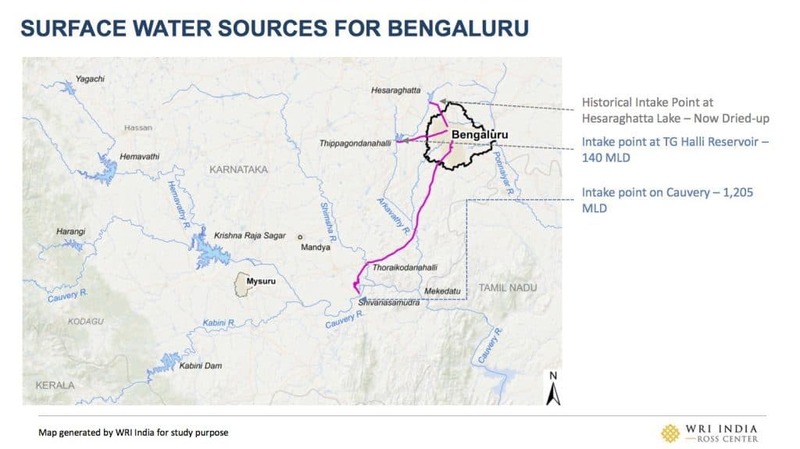 Bengaluru shifted its entire water dependency on the Cauvery following the formation of the Bangalore Water Supply and Sewerage Board (BWSSB) in 1964 and the inception of the Cauvery Water Supply Scheme in the year 1969, the study by Unnikrishnan said. BWSSB spends nearly 60 percent of its budget in pumping water to Bengaluru. Swallowed up by unplanned development, from 1452 interconnected water bodies in the year 1800, the number has gone down by 60 percent to 194. “Present day Bengaluru’s spatial extent is 741 square km. In this area of 741 square km in 1800 there were 1452 interconnected water bodies constructed by our elders taking advantage of undulating terrain,” Ramachandra said. Loss in tree cover impacts water availability and water quality at a catchment level. Map by WRI India. With their storage capacity of about 35 TMC (thousand million cubic feet), these water bodies not only aided in addressing the water demand but also helped in storing the excess during high rainfall year and mitigate floods. Now there are 194 water bodies in 741 sq km and most of these lakes have large deposits of silt accumulated over last four decades due to non-management or lack of maintenance. The current capacity of lakes is five TMC but due to siltation the actual storage capacity is just 1.2 TMC, according to TV Ramachandra. Ramachandra claimed rainwater harvesting through rejuvenated lakes would meet 70 percent of the city’s water demands. “Reduction in surface water bodies impacts the natural groundwater recharge process. Reduction in open space means reduction in natural groundwater recharge and freshwater flows to lakes,” Basak said. The resulting degradation and conversion of the city’s water bodies has reduced the resilience of Bengaluru to flooding and drought, especially affecting the poorest and most vulnerable of its residents, explained Unnikrishnan. “In preserving and rejuvenating the existing lakes in an inclusive and sustainable manner, one can both retain these ecological benefits, provide for aesthetic and recreational green spaces within the city, while yet providing an inclusive and just urban space that respects the needs of even the most marginalised communities,” Unnikrishnan said. According to data quoted in the study, only 72, 000 properties in Bengaluru have implemented rainwater harvesting (RWH) after the Bangalore Water Supply and Sewerage Board (BWSSB) made it compulsory through the Bangalore Water Supply and Sewerage (Rainwater Harvesting) (Amendment) Regulations 2011. “Even if RWH is implemented, the operation and maintenance of these structures and therefore the effectiveness of these structures is questionable,” Basak mentioned. Amid the despair, however, community involvement in restoration of water bodies has held out hope. Citing the examples of Jakkur and Kaikondrahalli lake restoration attempts, Unnikrishnan underscored the importance of community engagement but also stressed on “working together with local nodal agencies who are in charge of lake maintenance, as well as other aspects of lake health such as sewage treatment, sewage inflow, encroachments. “I would say that citizen engagement is required both at the level of restoring and rejuvenating the resource as well as networking with nodal agencies to form a sustained, long-term relationship,” she added.